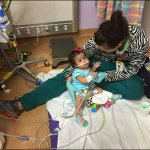 Less than three months after being separated from her twin sister in a 26-hour operation at Texas Children’s Hospital, Knatalye Hope Mata was released to the care of her family. 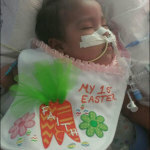 Knatalye was discharged from the hospital on May 8, just in time for Mother’s Day. 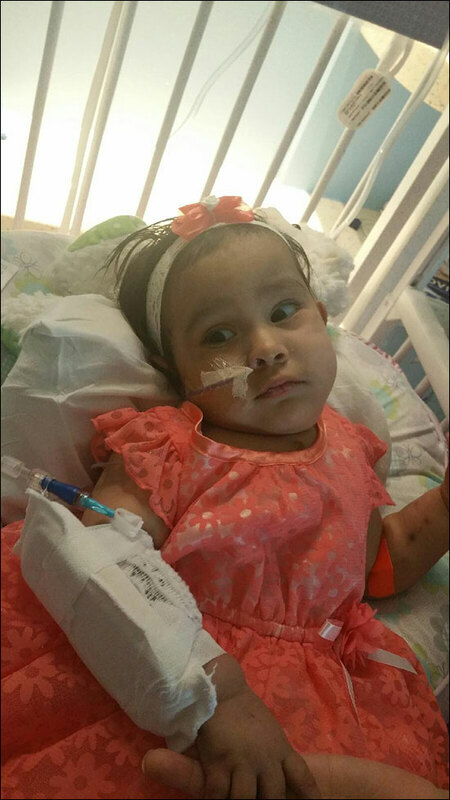 Her family lives in Lubbock but will remain in Houston until Knatalye’s sister, Adeline Faith, is able to go home. Doctors anticipate that homecoming to be within the next few months. 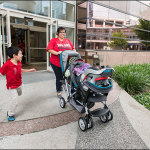 Formerly conjoined twins Knatalye and Adeline were born at Texas Children’s Pavilion for Women on April 11, 2014 via Caesarean-section at 31 weeks gestation after weeks of extensive prenatal imaging, multidisciplinary consultation and planning at Texas Children’s Fetal Center. Surgeons allowed the girls to grow and gain strength for 10 months before undertaking the difficult task of separating them. During the procedure, the surgical team worked in shifts to separate the twins, who shared a chest wall, pericardial sac, diaphragm, liver, intestines, bladder, uterus and pelvis. Since then, Knatalye and Adeline have been healing quickly and are continuing to progress well as two little girls. 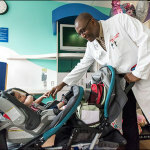 Many of their caregivers, including Dr. Darrell Cass, lead surgeon and co-director of Texas Children’s Fetal Center, and Dr. Oluyinka Olutoye, lead surgeon and co-director of the Texas Fetal Center, came by Knatalye’s room last week to bid her farewell. 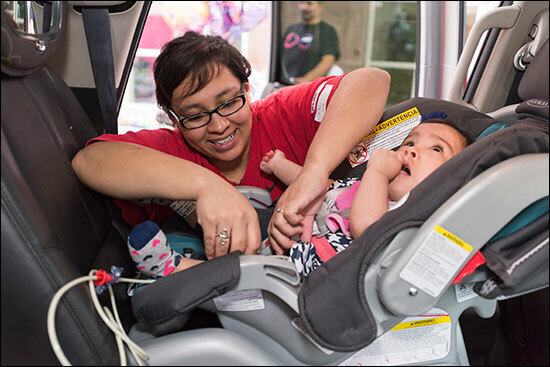 Smiles and hugs were exchanged before the 1-year-old was strapped into a car seat in the back of her family’s SUV. Shortly afterward, Knatalye left the only place she has ever known. 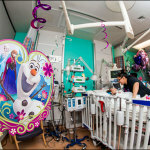 Although she will be back for follow-up care, Texas Children’s is no longer her primary home. It’s her home away from home, which is exactly what everyone hoped it would become. 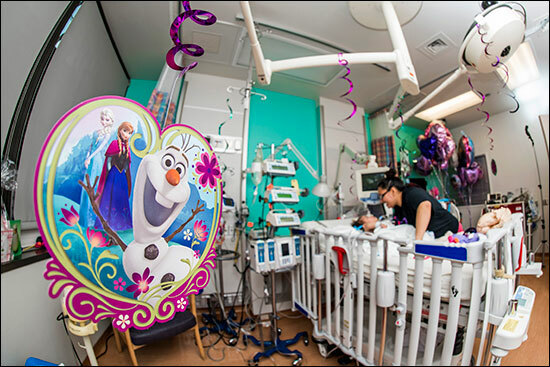 Surrounded by Disney’s “Frozen themed party decorations and pink and purple birthday hats, Knatalye Hope and Adeline Faith Mata reached a monumental milestone April 11 when they turned 1 year old. 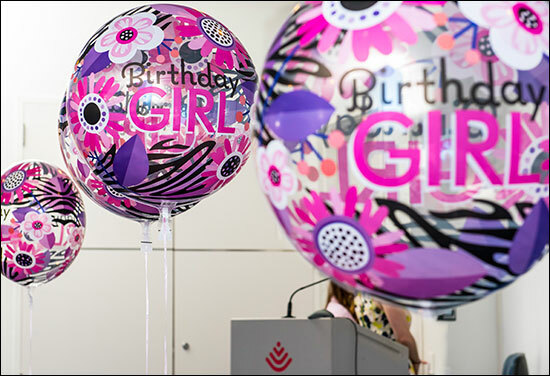 The girls’ birthday fell almost a month after their successful separation surgery, during which a team of highly-specialized surgeons worked in shifts for more than 24 hours to make the girls two. 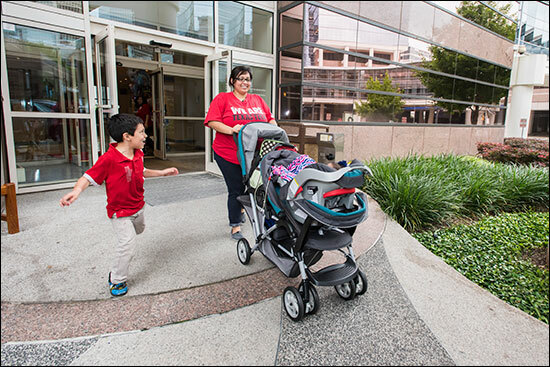 Knatalye and Adeline were born at Texas Children’s Pavilion for Women on April 11, 2014 via Caesarean-section at 31 weeks gestation after weeks of extensive prenatal imaging, multidisciplinary consultation and planning at Texas Children’s Fetal Center. The babies each weighed 3 pounds, 7 ounces. Surgeons allowed the girls to grow and gain strength for 10 months before undertaking the difficult task of separating them. Since then, the twins have been progressing well as two separate little girls. 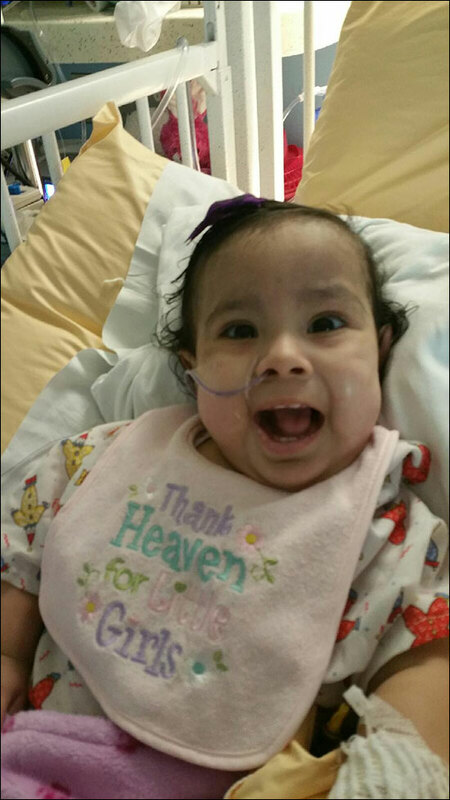 On April 8, Adeline underwent surgery to place a tracheostomy to aid in her breathing and lung development. 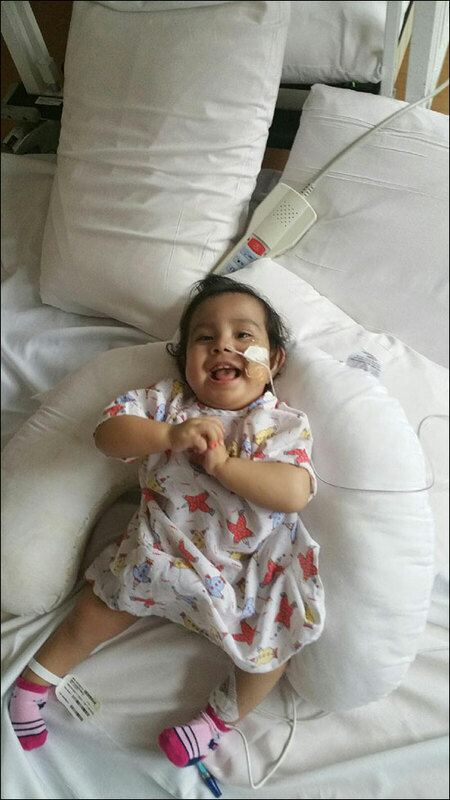 The surgery also included removing the metal rods placed in her pelvis during the initial separation surgery, removing some shunts in her bladder and also placing a gastrostomy button, a special tube which helps to deliver food and medicines until a child can chew and swallow. 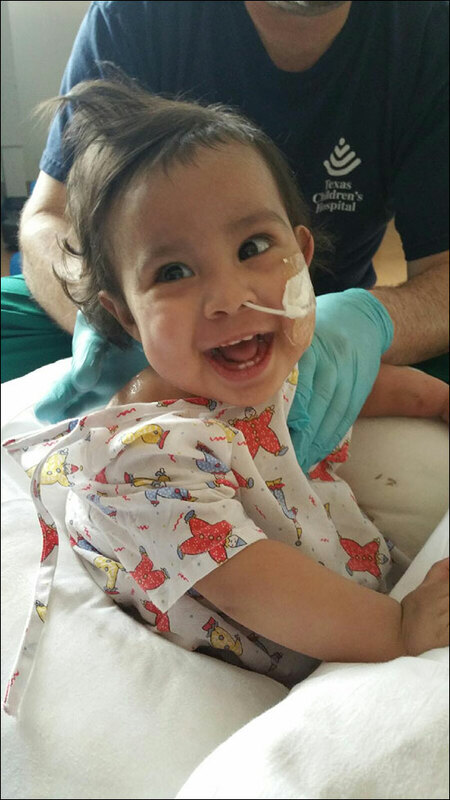 Adeline remains in the hospital’s Pediatric Intensive Care Unit and continues to receive daily physical and occupational therapy. 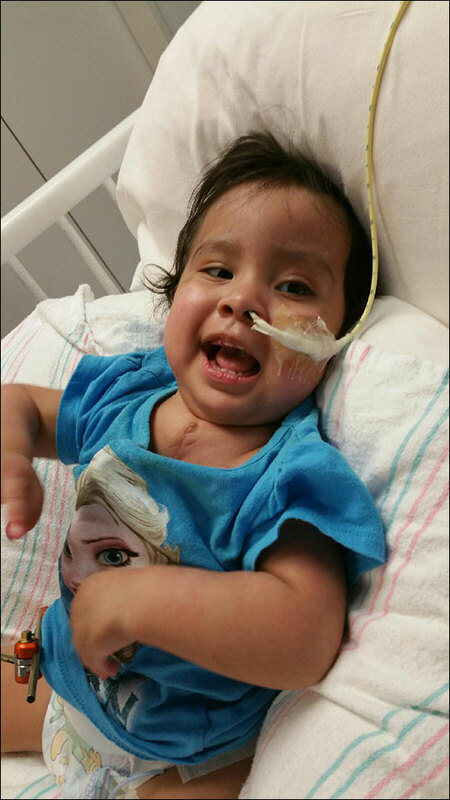 On April 13, Knatalye underwent surgery to remove the rods in her pelvis and also to add a gastrostomy button for her feedings. 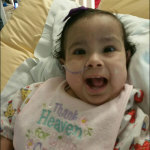 She is currently on room air (no breathing assistance) and recovering from surgery in the PICU. She will resume daily physical and occupational therapy once fully recovered. 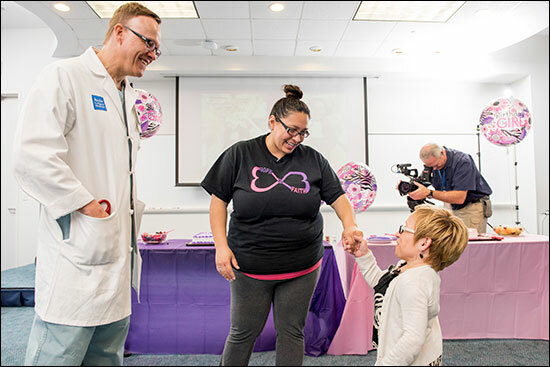 Cass was one of several people who stopped by a celebration held by Elysse Mata on April 9 at the hospital to honor all of the Texas Children’s staff involved in the girls’ care over the past year. 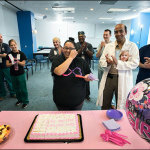 In between bites of birthday cake, Warren Boudreau, the surgical business analyst who helped prepare the operating room for the twins’ separation surgery, said he stopped by the party because he wanted to meet Elysse and tell her how proud he was to be part of something so unique and interesting. Alvin Perkins, the supply chain manager for the operating room during the separation surgery, said he came by the party for similar reasons. 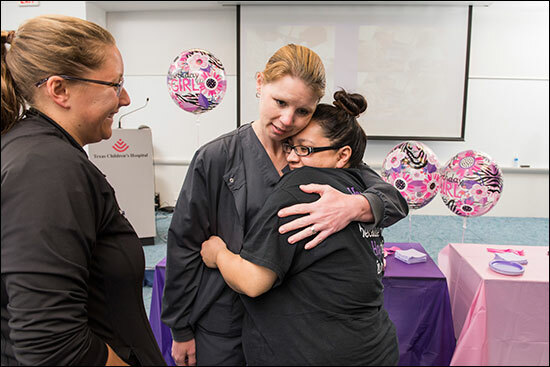 Chief of Pediatric Gynecology Dr. Jennifer Dietrich, one of the surgeons who operated on the girls during their separation, popped in between procedures to wish the girls a happy birthday. “I wish they could be here,” she told Elysee. Although the girls could not attend the celebration for their care givers, Knatalye was able to participate in a Disney’s “Frozen” themed birthday party for family and friends. One month after their successful separation surgery, Knatalye and Adeline Mata are progressing well as two separate little girls. 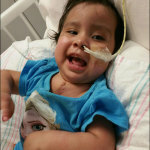 Knatalye can breathe on her own and was recently transferred to the Progressive Care Unit where she will resume her recovery. 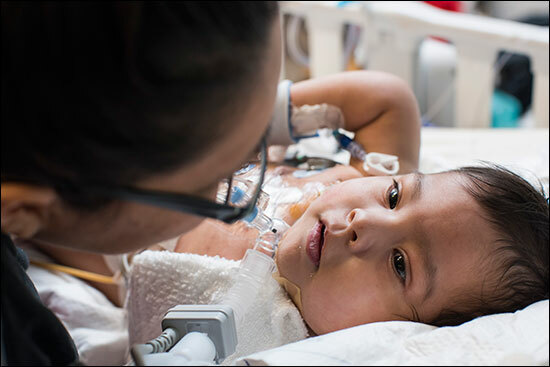 Her sister, Adeline, is still on a ventilator in the Pediatric Intensive Care Unit (PICU), but her doctors remain optimistic that she will breathe on her own just like her twin. 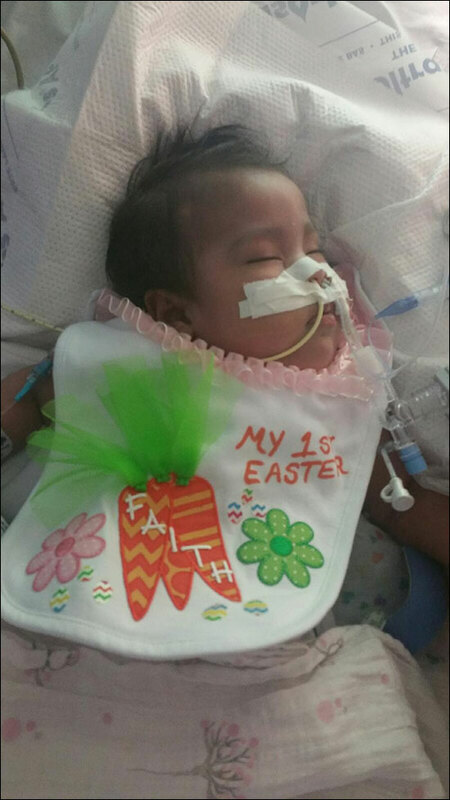 “Knatalye’s progress has been a tiny bit faster than Adeline, but it was just because of where they started out,” said Dr. Darrell Cass, co-director of Texas Children’s Fetal Center. “We’re still in the acute recovery phase of care where we’re working on breathing, sedation and pain management and working on their intestinal function. Prior to the girls’ separation surgery, Knatalye and Adeline spent the first 10 months of their life in the Neonatal Intensive Care Unit (NICU) where they received daily care from their team of NICU nurses. 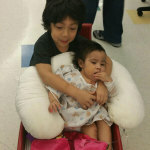 To adequately prepare them for their separation surgery, the NICU nurses helped engineer a custom bed space for the girls in the NICU and collaborated with Hanger Clinic, to devise a swing that would safely keep the twins upright for a large portion of each day after their tissue expanders were in place. 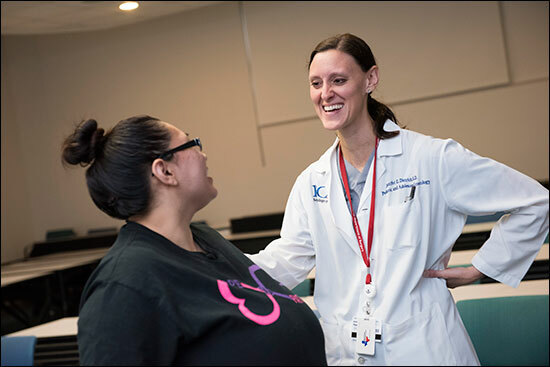 To ensure a smooth transition of care for the girls and their family, the NICU nurses partnered with the PICU team before and after the separation surgery. 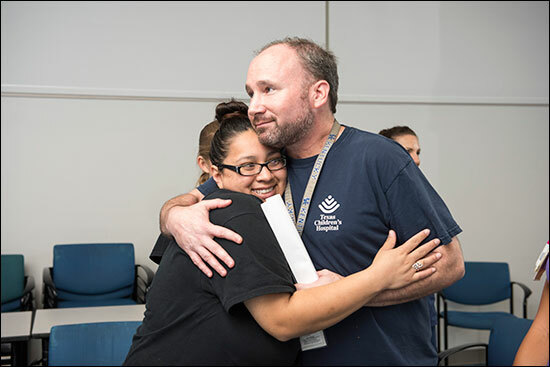 “We sent a couple of nurses per shift for the first few days post operatively to kind of be there as a familiar face for the family as they began to build their relationships with nurses in the PICU,” Luton said. 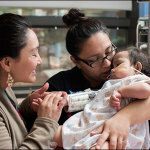 Each of the babies had a PICU nurse and a NICU nurse for the first few days after separation surgery. 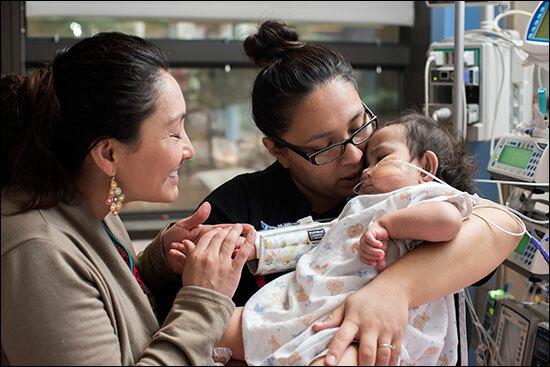 In addition to receiving around-the-clock care from the PICU nurses, Knatalye and Adeline receive therapy every day – physical therapy in the morning and occupational therapy in the afternoon to optimize their muscle development and motor coordination. 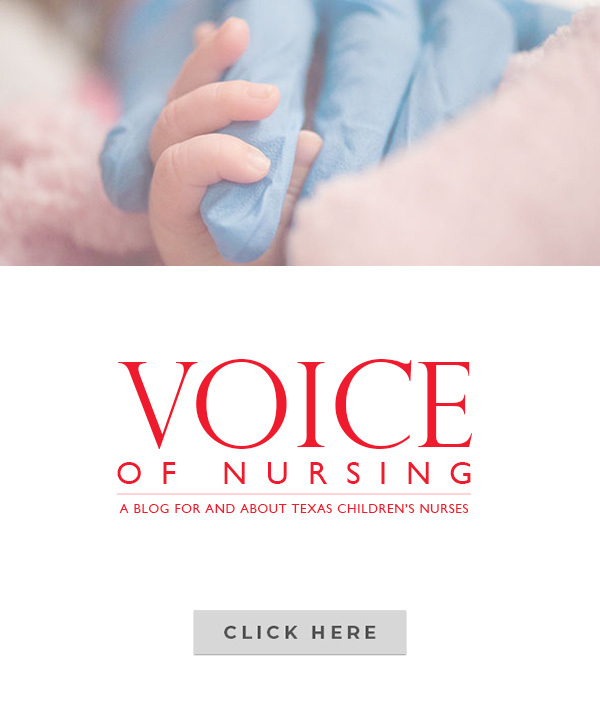 “We are practicing a lot of reaching and grabbing using both hands, bringing their hands together, banging toys together, visual tracking, “said Texas Children’s occupational therapist Chelsea Pierce. Texas Children’s physical therapist Frank McCormick assists the girls with head control, trunk control, stretching, range of motion and working with their feet. While Knatalye and Adeline’s recovery will take some time, their doctors are optimistic about their future. 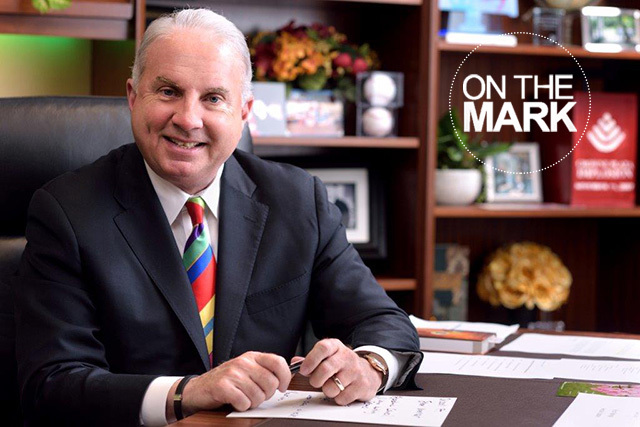 Texas Children’s Surgeon-in-Chief Charles D. Fraser also shares that same spirit of optimism. During the early morning hours of February 17, Elysse Mata sat holding her babies tightly, kissing them as tears ran down her face. 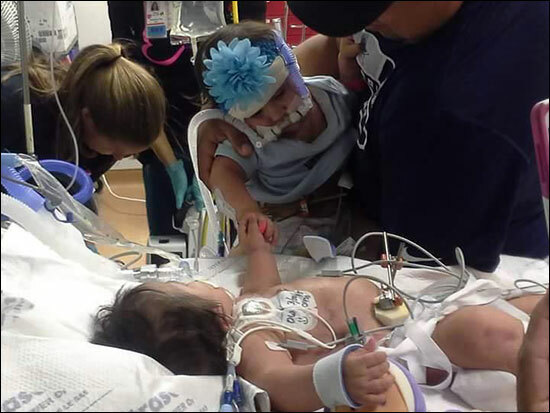 She was saying goodbye to her girls, conjoined for the last time before undergoing a historical surgery that would offer them their first chance at separate lives. 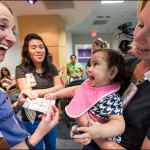 Conjoined twins Knatalye Hope and Adeline Faith Mata – known by their family simply as Hope and Faith – were born at Texas Children’s Pavilion for Women on April 11, 2014 via Caesarean-section at 31 weeks gestation after weeks of extensive prenatal imaging, multidisciplinary consultation and planning at Texas Children’s Fetal Center. The babies each weighed 3 pounds, 7 ounces. Surgeons allowed the girls to grow and gain strength for 10 months before undertaking the difficult task of separating them. During that time our comprehensive team of surgeons, physicians, nurses and support staff prepared for the day that had finally arrived. 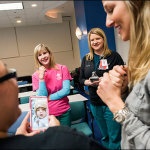 The lead surgeons had met and thoughtfully examined every aspect of their procedure, the simulation staff prepared the team for complications, and Critical Care nurses were readying the PICU for the girls post-surgery. 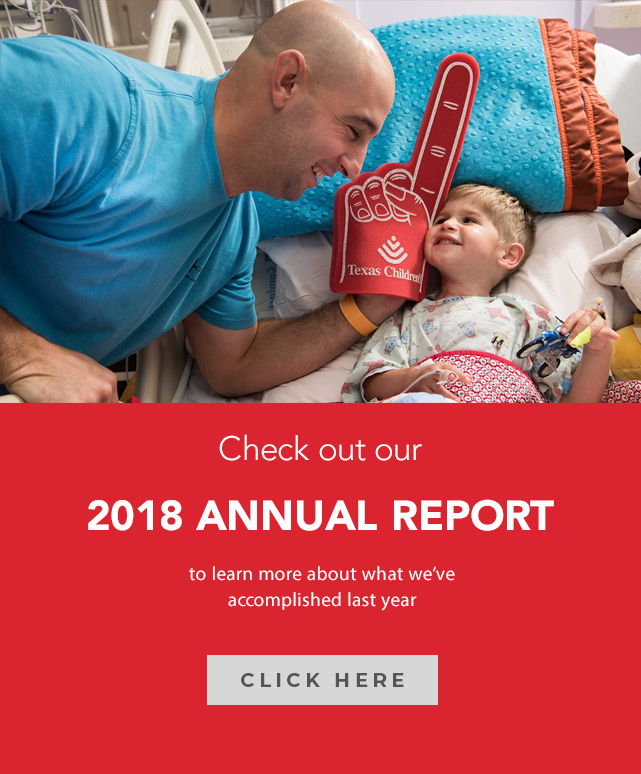 In those quiet, prayerful moments before the surgery, Elysse’s husband, John Eric, and their 5-year-old son, Azariah, were also near, kissing the girls’ foreheads and squeezing their tiny hands while they anxiously awaited the start of the surgery that would change the girls’ lives forever. A group of extended family, friends and a Texas Children’s Hospital chaplain joined the Matas for an emotional prayer. 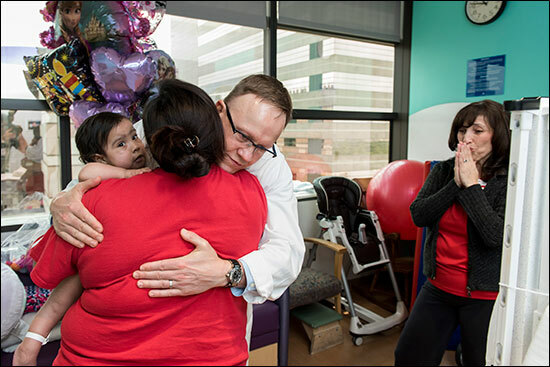 Lead surgeon Dr. Darrell Cass entered the room, gave the family a hug, and with the help of supporting operating room staff, escorted the girls to Texas Children’s Operating Room 12. 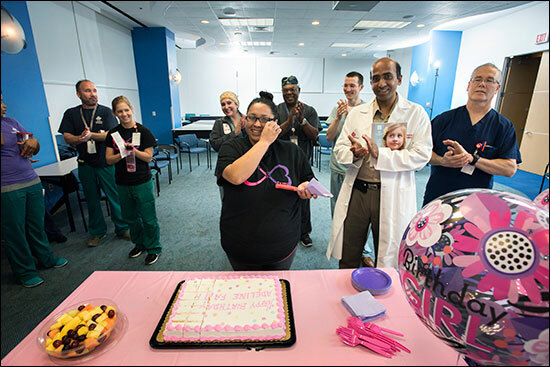 Members of the girls’ NICU care team, who had been by their sides for almost a year, lined the hallways in an emotional show of support. Just after 7 a.m., Hope and Faith were wheeled into the operating room where a team of 12 surgeons from seven specialties, six anesthesiologists, eight highly trained nurses and support staff spent nearly 24 hours performing an operation that would eventually separate the twins. During the first few hours of the procedure, Anesthesiologist Dr. Helana Karlberg and Surgical Nurse Audra Rushing prepped the girls for surgery. At 1:10 p.m., Chief of Plastic Surgery Dr. Larry Hollier made the first incision. For the next 18 hours, the surgical team worked in shifts to separate the twins, who shared a chest wall, pericardial sac (the lining of the heart), diaphragm, liver, intestines, bladder, uterus and pelvis. As the surgeons continued the difficult task, family and friends gathered in a large, room praying and supporting the parents while they waited for updates from the surgical team. At one point, the family was told there had been a rocky part in the procedure when the twin’s livers were being operated on. During that process, surgeons explained there was quite a bit of blood loss and that the anesthesiologists and cardiologist in the room had to keep up with that and maintain the girls’ blood pressure. 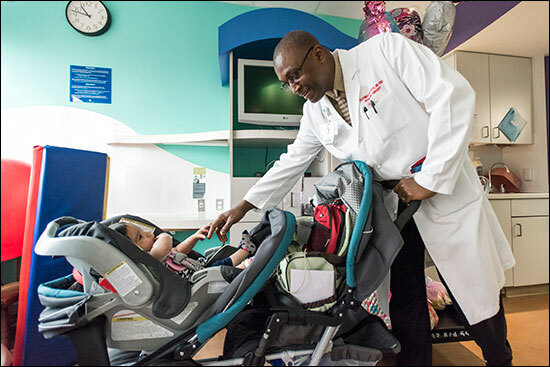 Hours later, Eric and Elysse heard the answer to months of prayers when Pediatric Surgeon Dr. Oluyinka Olutoye met them in a private consult room and delivered the good news – the twins had been successfully separated. 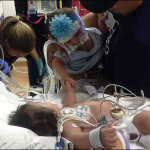 Separate for the first time, the twins were taken to different operating rooms where surgeons continued to work on the girls’ critical organs. 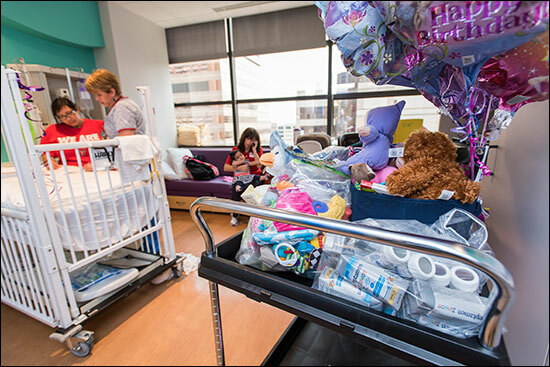 Just before 10 a.m., the surgery was complete, and the family visited their girls, apart for the first time in rooms next to each other in the PICU, where they are being cared for by a team of their NICU primary nurses and their new PICU nurses. Elysse said she and her family are extremely grateful for the team that separated her babies, and the countless hours they put into understanding the girls’ condition, and how best to treat and care for them. 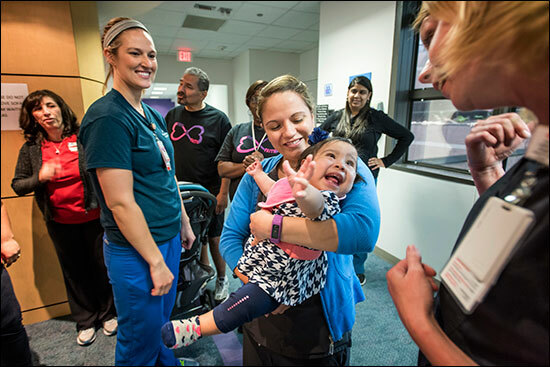 Cass and several of the other surgeons, including plastic surgeon Dr. Ed Buchanan, met the family in Adeline’s room to share in the family’s joy and relief. 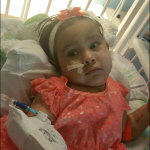 They gave the family a summary of the monumental procedure and explained what they should expect in the next few days. Hollier said that to the best we know this is the first time a case of this magnitude – conjoined twins connected at the chest, abdomen and pelvis – has ever been done. Click on the photo to view a gallery showing the Mata’s journey to separation. By late morning Wednesday, February 19, Elysse and John Eric were again with their babies, watching over their girls, now in two beds, in adjoining PICU rooms. 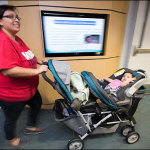 It was a moment they had been waiting for since more than a year ago when a routine ultrasound revealed that Elysse was carrying conjoined twins. 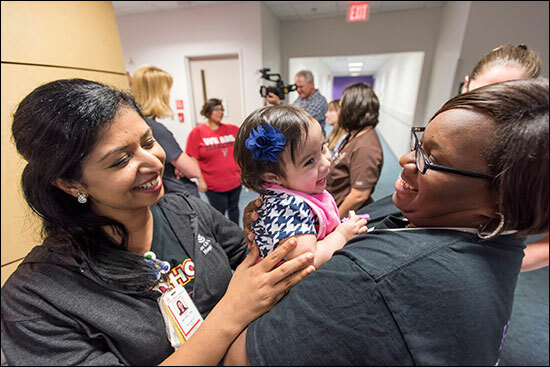 They traveled from their hometown of Lubbock to Texas Children’s Fetal Center, where the next chapter of their journey began. Today, their family has a promising new chapter, thanks to the compassionate expertise of our physicians, nurses and countless staff and employees. 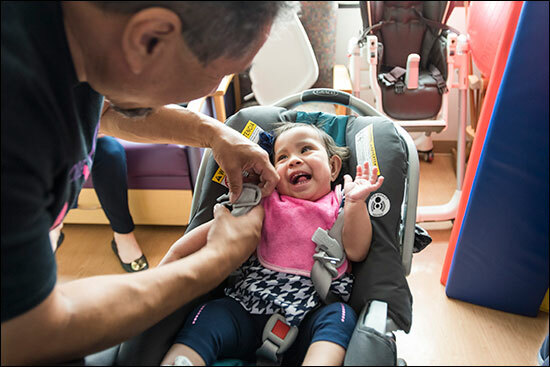 Taking care of conjoined twins, Knatalye Hope and Adeline Faith Mata, is hard, even for the highly-trained medical staff charged with looking after the two 9-month-old girls. Diaper changes, baths, feedings, even moving the girls from one place to the other takes a lot of effort, thought and hands. 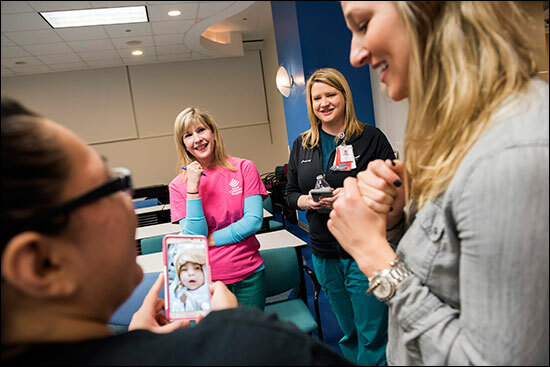 So, when the team of surgeons assigned to the twins asked the girls’ primary nurses and physical therapist to figure out a way to help the twins sit up, Frank McCormick, Jennifer Pitlik and Jennifer McGinnis were stumped. “We were all just deer in the headlights,” said Pitlik, one of the twins’ primary care nurses. McCormick, the twins’ physical therapist, had devised things to hold the girls upright before, but Knatalye and Adeline always outgrew them. “We had to come up with something else,” McCormick said. The surgeons wanted the girls upright to keep pressure off the custom-made tissue expanders they put in the girls’ chest and abdomen area last month. The expanders will help stretch the babies’ skin in preparation for their separation surgery, which is expected to take place next month. The surgeons also wanted the girls to spend time sitting up so they could continue to develop normally. For a little more than a month, Pitlik, McCormick and McGinnis, the twins’ other primary nurse, worked with Hope Whitten, an orthotist and prosthetist at Hanger Clinic, to come up with a device that would safely keep the twins upright for a large portion of each day. What they came up with was a u-shaped device that supports the twins’ backs, bottoms and heads. The device’s headrests are removable to allow for more movement and the main portion of the device is equipped with growth liners that can be taken out as the girls continue to get bigger. 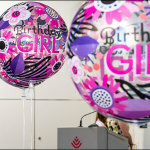 Whitten, who helped build the device based on a computer-generated model and body scan of the girls, said she knew she had done something right when she saw the girls sleeping in the swing. “It’s just been a neat process to watch it (the swing) evolve over time and how things have changed and what we’ve had to do,” he said. Pitlik and McGinnis agreed and said they both stepped out of their comfort zones to do what was best for Knatalye and Adeline. 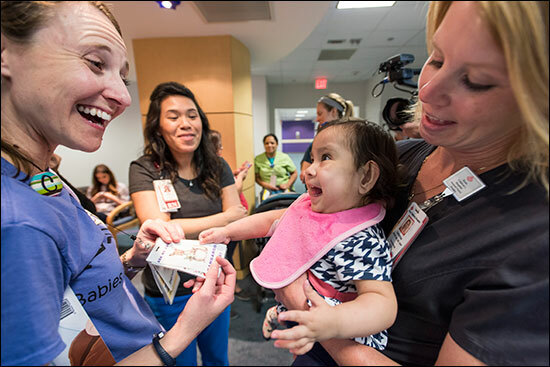 Knatalye and Adeline were born April 11 at Texas Children’s Pavilion for Women. Delivered via Caesarean-section at 31 weeks gestation, the twins each weighed 3 pounds, 7 ounces. 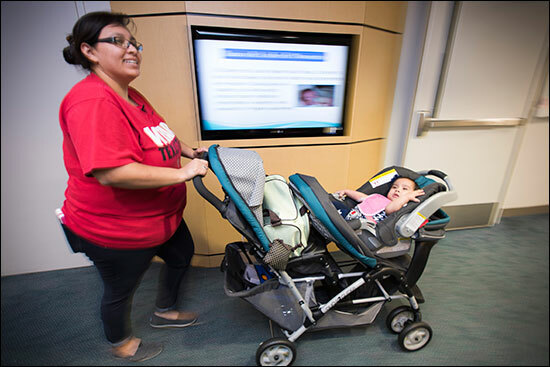 The girls’ parents, Elysse and John Mata, and their 5-year-old brother, Azariah, learned during a routine ultrasound on January 13 that Elysse was carrying twins and they were conjoined. 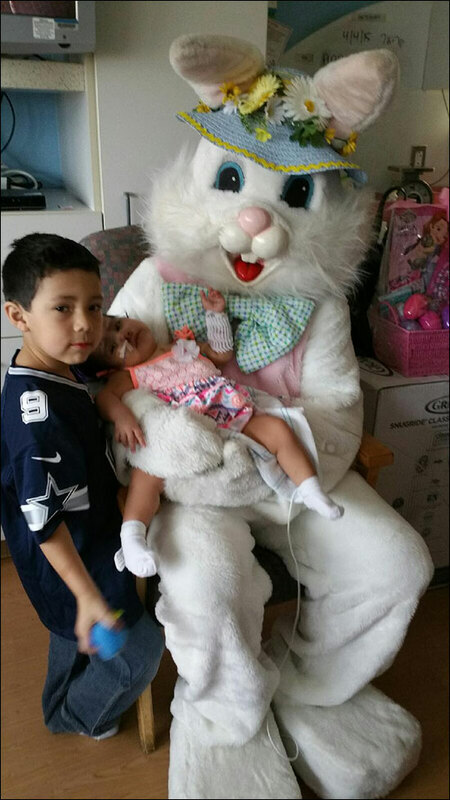 Subsequently, the family was referred from a physician in Lubbock, their hometown, to the Texas Children’s Fetal Center where they underwent extensive prenatal imaging, multidisciplinary consultation and development of plans to achieve a safe delivery and postnatal care. 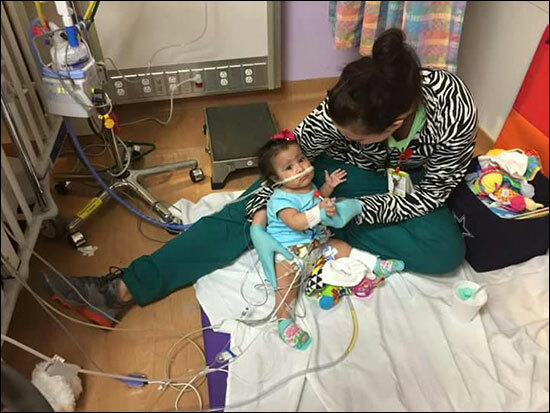 Now 9 months old, the babies are doing well as they continue to be cared for by a team of specialists in the Level IV Neonatal Intensive Care Unit at Texas Children’s Hospital. 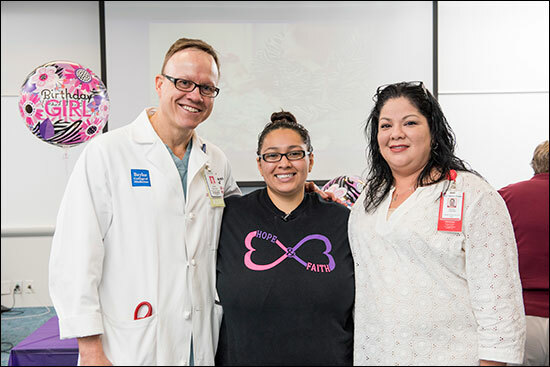 Conjoined 8-month-old twin girls, Knatalye Hope and Adeline Faith Mata, underwent a five-hour surgery December 16 at Texas Children’s Hospital Main Campus to place custom-made tissue expanders into their chest and abdomen area. The tissue expanders will help stretch the babies’ skin in preparation for their separation surgery, which is expected to take place early next year. During their recent surgery, the infants also had an examination to help assess their anatomy and the placement of PICC catheters in preparation for the twins’ separation. Dr. Alberto Hernandez with Interventional Radiology performed the examination. Chief of Plastic Surgery Dr. Larry Hollier and Dr. Ed Buchanan with the Division of Plastic and Reconstructive Surgery conducted the tissue expander placement surgery. 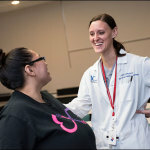 Dr. Helana Karlberg led the anesthesia team and Audra Rushing led the surgical nursing team. The tissue expander placement surgery requires a recovery time of six to eight weeks, during which additional fluid will be added to the tissue expanders, which are like balloons, to allow the skin to be stretched gradually. The extra skin is needed to provide coverage once the babies are separated. During the girl’s recovery, the planning process for the separation surgery will continue among a team of multidisciplinary specialists in pediatric surgery, urology, plastic surgery, orthopedic surgery, cardiovascular surgery and pediatric gynecology. Anticipated to take approximately 24 hours, the separation surgery will involve two teams of surgeons who will work together to separate the twins, who share a chest wall, lungs, pericardial sac (the lining of the heart), diaphragm, liver and pelvis. 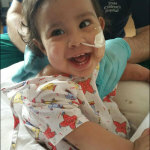 The separation team will start the surgery and the reconstruction team will complete the procedure. 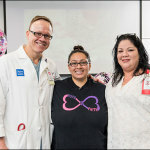 Surgeons at Texas Children’s Hospital in 1992 successfully separated Tiesha and Lesha Turner, who were 1 year old and shared a sternum, liver, entwined intestines and fused organs. 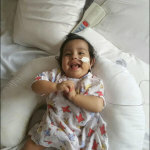 The separation of Knatalye and Adeline will be the second such procedure performed at the hospital. Cass said he expects the surgery to go well and for each child to be able to live independently and to have a good life. 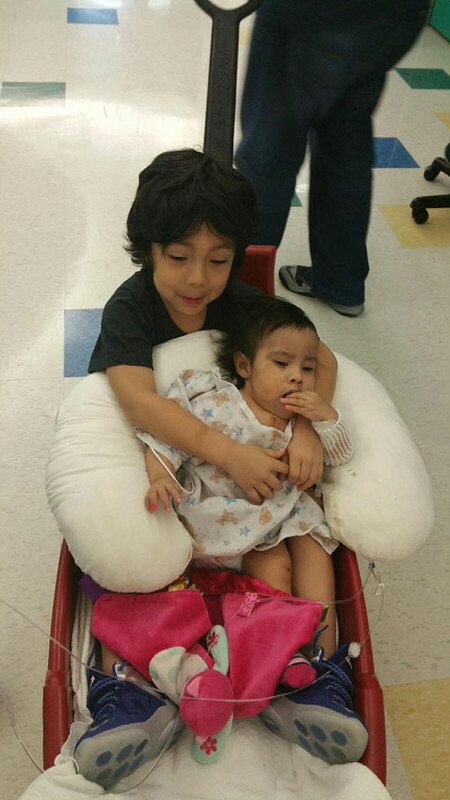 The girls’ parents, Elysse and John Mata, and their 5-year-old brother, Azariah, learned during a routine ultrasound on Jan. 13 that Elysse was carrying twins and they were conjoined. 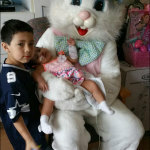 Subsequently, the family was referred from a physician in Lubbock, their hometown, to the Texas Children’s Fetal Center where they underwent extensive prenatal imaging, multidisciplinary consultation and development of plans to achieve a safe delivery and postnatal care. 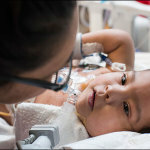 Now 8 months old, the babies weigh about 15 pounds each and are doing well as they continue to be cared for by a team of specialists in the Level IV neonatal intensive care unit at Texas Children’s Hospital. 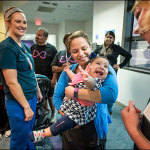 Elysse Mata said the day before the tissue expander placement surgery she is confident her girls are in good hands at Texas Children’s Hospital.